MongoDB is a NoSQL database designed for ease of development and scalability to support massive data processing and storage. Since NoSQL databases, like MongoDB and Cassandra, allow for virtually unlimited scaling of applications, they greatly increase application infrastructure complexity. Therefore, implementation of a MongoDB monitor is necessary in database administration for diagnosing issues and planning load distribution. With Applications Manager's MongoDB monitoring capability, gain in-depth visibility into the key metrics and understand MongoDB performance efficiency. Applications Manager MongoDB monitoring tool is one of the very few MongoDB monitoring tools that offer deep visibility into MongoDB metrics coupled with intelligent analytical features for performance trend analysis and forecasting utilization trends. With the mongoDB performance monitoring tools offered by Applications Manager, get thorough details about important key performance parameters, spot bottlenecks, and troubleshoot it before it affects the end users. Proper monitoring of read and write requests helps prevent resource saturation, avoid overloading databases, and optimize MongoDB's performance. Utilize Applications Manager's MongoDB performance monitoring feature to monitor lock stats such as the number of read/write locks and active users performing those operations to prevent any latency problems. Like most MongoDB monitoring tools, Applications Manager MongoDB performance monitor also provides you with database operation statistics along with replication and sharding operation details with which you can ensure that operations are happening consistently by monitoring the total number of database operations (insert, getmore, delete, update and command) per second. Since MongoDB enters every change in a journal, tracking those values gives you an insight on loads. Applications Manager MongoDB monitoring software gathers polled data for commits to the journal in the last commit interval, commits behind a write lock and commit before scheduled interval. You can also get background flush stats, like the total time taken in writing the data to disk. Learn how you can optimize your MongoDB performance with Applications Manager. Schedule a personalized demo now! With Applications Manager MongoDB performance monitor, get notified of all performance issues and troubleshoot faster with root cause analysis that enables database administrators to find the origin of the problem with ease. Setting threshold values will help prevent performance bottlenecks and resource saturation. 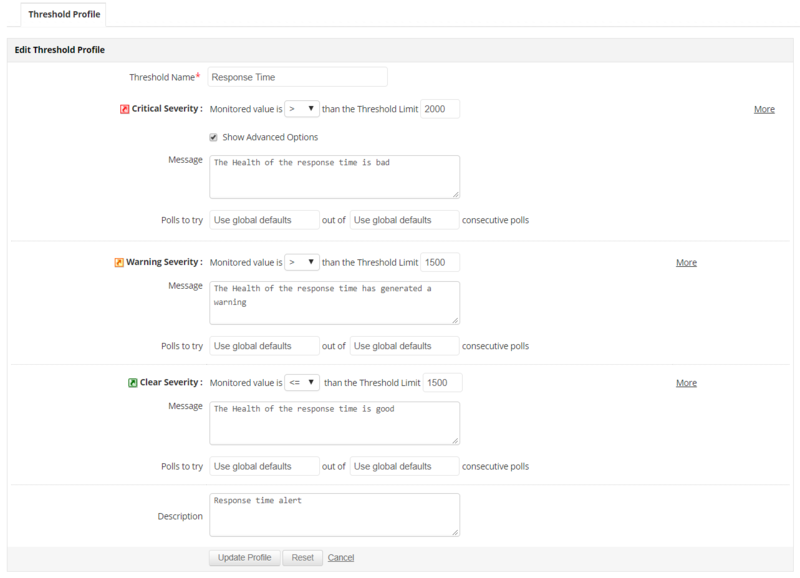 Using Applications Manager MongoDB performance monitoring tools, configure thresholds for important metrics and get alerted when they are breached, and set up actions for the same based on the order of severity. Exploit Applications Manager MongoDB monitor's reporting capabilities to analyze and understand the performance trends of MongoDB. With Applications Manager's reporting facility, visualize and track all the important metrics, and make informed decisions regarding your servers. Get historical reports of various attributes over a period of time and compare the reports of various databases. Applications Manager MongoDB performance monitoring software employs machine learning techniques to help forecast load and plan capacity of database servers. Trend analysis reports allows you to get insight into the performance trends of important attributes which aids in better planning and allocation of resources. Applications Manager MongoDB monitoring software supports all versions of MongoDB up to version 4.0.2.